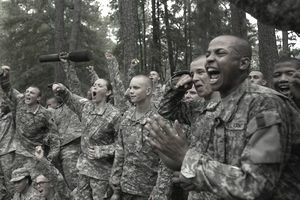 There are many things you should study and do prior to attending Army Basic Training. For starters, work out! Get physical by running, doing calisthenics, lifting weights, and wearing a backpack and walking at a fast pace to prepare for what you will experience throughout training. Note: If you are currently running, this workout will be too easy and you should progress further and faster to be able to ace the 2 mile timed run event as the rucking at Basic Training. The Soldier’s Creed, Army General Orders of the Sentry, Code of Conduct, Army officer, and enlisted ranks, also the Army Core Values. If you can know these prior to Basic Training, you will have a little bit of time to focus on other things like cleaning the barracks, folding laundry, and learning new skills, while those who are unprepared work to memorize the above. However, when you are enduring Basic Training, you will be asked these three General Orders throughout training under increasing pressure from your instructors. Start getting into shape before you leave. Boot camp is physically intensive. Work especially on running and pushups. If you know someone who's been in the military, ask him/her to teach you some simple marching and facing movements. Memorize your particular service's rank structure (both officer and enlisted) before you leave. Inform your family and friends that it's very important that they write often. Boot camp can be very lonely. Practice making your bed with "hospital corners." Don't arrive "standing out in the crowd." Cut your hair short, and wear conservative clothes. You don't want the D.I.s to remember you. Bring ONLY what is on the list. Anything extra will be confiscated and will give the D.I. an excuse to chew you out. Go in with the right attitude. Remember, EVERYONE messes up in boot camp, and EVERYONE gets chewed out. The "real military" won't be this way. Do exactly what you're told to do, when you're told to do it, and how you're told to do it. Don't be inventive. When speaking to a D.I., always stand at rigid attention, eyes locked forward. Don't volunteer. You're much better off in boot camp if the D.I. hardly remembers your name. Those who are "remembered" often get "special attention." If you're "on time," then you're late. Always be where you're supposed to be five minutes early. Remember, boot camp is mostly a mind-game. It's designed to tear-down your civilian self and replace it with a military soldier (sailor, marine, airman). Read everything you can about the military service you're going into. The more you learn before-hand, the less you'll have to learn in boot camp (where you'll be tested). And work out. Do not think it is the job of the military instructors to get you in shape. If you show up out of shape, you will likely fail the standards or get injured and potentially sent home.